Martin Kampmann was one judge away from achieving his dream of challenging welterweight king Georges St-Pierre for his crown at UFC 129. Instead, his controversial split decision loss to Jake Shields last October leads him into a different kind of “Dream” matchup tonight against Diego “Don’t Call Me Nightmare” Sanchez. While his opponent has opted to swap out his nickname mid-career, Kampmann believes he’ll be facing the same ‘ol relentless Diego when the cage door slams shut this evening inside the KFC Yum! Center in Louisville, Kentucky. “I think he’s back to his old self [now]. He’s rediscovered himself and is back at [Greg Jackson’s camp], so I think he’s going to be a very game and dangerous opponent,” Kampmann told Sherdog. Speaking of dragging, Kampmann is well aware the former “The Ultimate Fighter 1” winner may look to plant him on his back ASAP. If that’s the case, the slugger promised there will be severe consequences. Just don’t blame him if Sanchez experiences some horrific nightmares following tonight’s shootout. 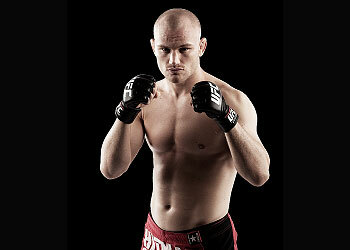 Kampmann owns an underrated 17-4 record, with 13 of his wins coming of the devastating finish variety. When asked if beating “Dream” would put him right back in the championship picture, the Dane refused to look past tonight’s opponent. Versus will broadcast this evening’s show live beginning at 9PM ET/6PM PT.